This exercise improves your back, shoulders, muscle balance, and body coordination - making it easier to keep the spine stable. 1. 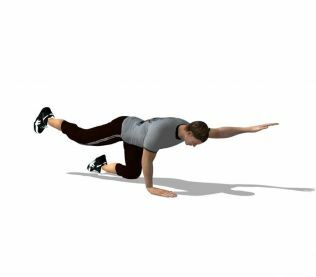 Begin on all fours, knees hip-width apart and under the hips, hands flat and shoulder-width apart. 2. Squeeze your core by pulling belly toward spine. Keep the spine neutral, without arching the back or rotating the hips, and extend your right leg back and your left arm straight ahead. 3. Hold for two to three seconds or as long as you can maintain form.